Wouldn’t it be great if there was a function that could count colored cells in Excel? Sadly, there isn’t any inbuilt function to do this. It can easily be done. Use the SUBTOTAL function to count colored cells that are visible (after filtering). There are two background colors used in this data set (green and orange). Go to Data –> Sort and Filter –> Filter. This will apply a filter to all the headers. Click on any of the filter drop-downs. Go to ‘Filter by Color’ and select the color. In the above dataset, since there are two colors used for highlighting the cells, the filter shows two colors to filter these cells. As soon as you filter the cells, you will notice that the value in the SUBTOTAL function changes and returns only the number of cells that are visible after filtering. The SUBTOTAL function uses 102 as the first argument, which is used to count visible cells (hidden rows are not counted) in the specified range. If the data if not filtered it returns 19, but if it is filtered, then it only returns the count of the visible cells. GET.CELL is a Macro4 function that has been kept due to compatibility reasons. It does not work if used as regular functions in the worksheet. However, it works in Excel named ranges. See Also: Know more about GET.CELL function. Let’s deep dive and see what to do in each of the three mentioned steps. Go to Formulas –> Define Name. In the above formula, I have used Sheet1!$A2 as the second argument. You need to use the reference of the column where you have the cells with the background color. This formula would return 0 if there is NO background color in a cell and would return a specific number if there is a background color. This number is specific to a color, so all the cells with the same background color get the same number. If you follow the above process, you would have a column with numbers corresponding to the background color in it. Somewhere below the dataset, give the same background color to a cell that you want to count. Make sure you are doing this in the same column that you used in creating the named range. For example, I used Column A, and hence I will use the cells in column ‘A’ only. This formula will give you the count of all the cells with the specified background color. 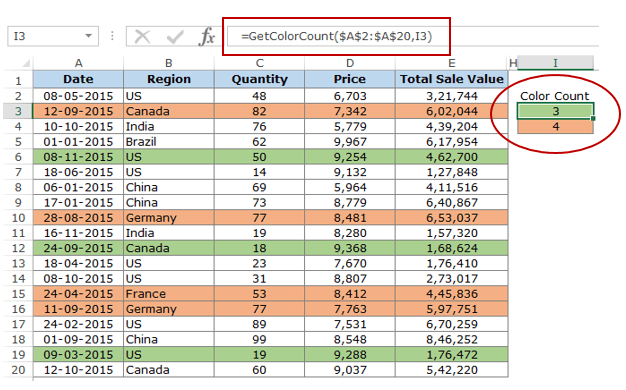 The COUNTIF function uses the named range (GetColor) as the criteria. The named range in the formula refers to the adjacent cell on the left (in column A) and returns the color code for that cell. Hence, this color code number is the criteria. The COUNTIF function uses the range ($F$2:$F$18) which holds the color code numbers of all the cells and returns the count based on the criteria number. In the above two methods, you learned how to count colored cells without using VBA. But, if you are fine with using VBA, this is the easiest of the three methods. 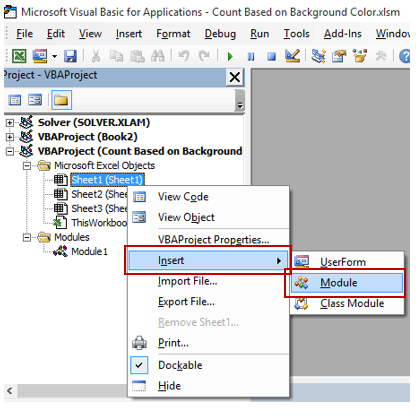 Using VBA, we would create a custom function, that would work like a COUNTIF function and return the count of cells with the specific background color. With your workbook active, press Alt + F11 (or right click on the worksheet tab and select View Code). This would open the VB Editor. In the left pane, under the workbook in which you are working, right-click on any of the worksheets and select Insert –> Module. This would insert a new module. Copy and paste the code in the module code window. Double click on the module name (by default the name of the module in Module1) and paste the code in the code window. That’s it! You now have a custom function in the worksheet called GetColorCount. To use this function, simply use it as any regular excel function. CountRange: the range in which you want to count the cells with the specified background color. CountColor: the color for which you want to count the cells. Note: Since there is a code in the workbook, save it with a .xls or .xlsm extension. 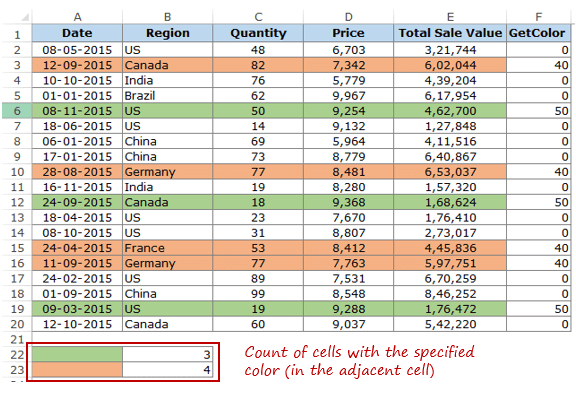 Do you know any other way to count colored cells in Excel? If yes, do share it with me by leaving a comment. Count Cells that Contain Text. Filter Cells with Bold Font Formatting. How to Format Partial Text Strings using VBA. 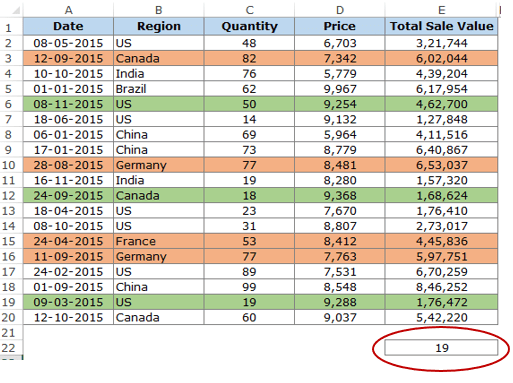 How to Quickly Highlight Blank Cells in Excel. Is there a way to apply this to rows rather than columns?! The VBA formula worked great on my spreadsheet. But, I saved it and re-opened and now all the cells where I had formulas say #Name?. I checked and the code is still in the module. It comes up in the list when I begin to type =getcolorcount. I tried removing the Code and re-inserting and can’t get the formula to work any longer. 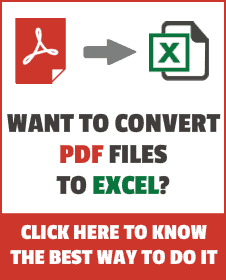 I’m using Excel 2010, is there any reason this suddenly wouldn’t work now? Please help – this formula was perfect for my spreadsheet for work because I didn’t want to have to add another column to the spreadsheet to get this to work. Does this work in an online excel sheet? Thanks for the VBA code, I used your code and it works perfect – it counts the colored cells, but it does not update automatically. If a new cell is colored, everyctime I have to click on the formula to have it update the count. Is there any other way to get this automated when a new cell is colored? I’m using your formula as part of a calendar to track equipment utilization by filling the cells with color when the equipment is used. The problem I’m having is that the formula does not automatically recalculate when new colored cells are entered. It does recalculate when you click on the cell containing the formula and press enter, but I’ve got hundreds of assets that I’m tracking and that’s not an efficient way of doing it. I’ve tried all the usual, F9, recalculate formula, recalculate worksheet, etc. nothing works. I’ve even recorded Macros of actually highlighting all formula cells and clicking enter. It works when I do it, but the macro returns a value error when used. Do you have a work around for this or another VB Macro that can be assigned to a radio button to recalculate the colored cell totals each time the calendar is updated? I found this article very useful, yet the VBA functions didn’t work. I have a table with various data, I used the conditional formatting in one column and built 5 rules and based on that cells have been colored in greed, red and yellow…any thoughts? But, now I want to do a little more. For the range of cells, I want to have 4 separate functions. 1) Count cells IF they are a particular color, as well as ending in “*o” 2) Count cells IF they are a particular color, as well as ending in “*s” 3) Count cells IF they are a particular color, as well as having 2 text characters in the cell, “? ?” and 4) Count cells IF they are a particular color, as well as having a number greater than zero in the cell, “>0”. How can I modify the base “GetColorCount” code to incorporate this additional parameter for each instance? I tried using your 3rd option but I am thinking that I am not right in doing so. Here is what I have and what I am trying to do. I have a spreadsheet with my supervisors and their clock-in times that I export from our schedule and then copy & paste into workbook. I color each row based on if they were on time, late but the time rolled back (7 minute grace period) and late but jumped forward 1/4 hour. I then filter by the supervisor’s last name and then by the “ErrorLog” header, checking only CLOCK IN & LATE CLOCK IN. The “Clock In” option could be either green (on time) or orange (late but rolled back) and then Late Clock In is yellow. The entire ErrorLog column is K10:K118, for all supervisors. Obviously when I sort by both Last Name and ErrorLog headers it reduces the number of rows and hides all the rest. I just want the formula to count each color that is visible. Is what I am doing even possible? I want to be able to change up the filter a bit by changing the Last Name so that I can only see each supervisor individually. Great video…. I do have a question for you… I used your code and it works perfect except for one thing, it counts the colored cells, but it does not update automatically. If a new cell is colored, I have to click on the formula to have it update the count. Is there a code I can add to have it update automatically once a new colored cell is added? Thanks again for a great video!!! I have 17 cells in a column, all under a conditional formatting to turn the cell color “light red” if a certain condition is met. There are only 3 cells that are “light red” (meeting the condition) but your VBA script returns an answer of “17”, meaning it considers all cells “light red”. Then I manually went in and colored one cell (not already highlighted by the conditional formatting) blue, and your VBA returned an answer of “16”. Clearly then, it does not recognize the results of conditional formatting, only “manually entered” colors. Any solution? This is critical as the colored cells will be different depending on what conditions are met. I need a way to count them per each condition. 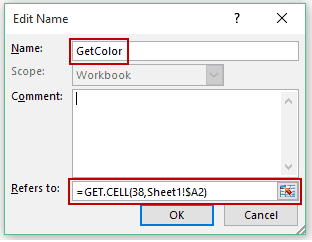 can you use both GetColorCount and Sumbycolor VBA in the same worksheet. 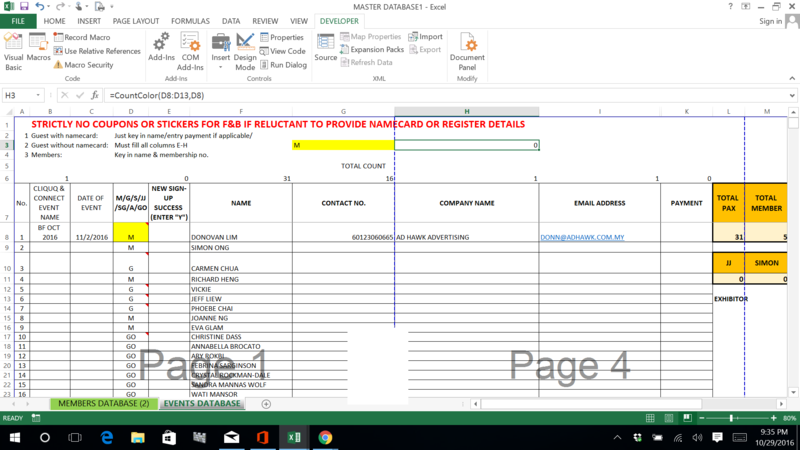 Can you please explain what is 38 mentioned in the name manager formula? What does it relate to? https://uploads.disquscdn.com/images/3f93ede176e443ec907f29b2d6cd8c3b4960f606edfc43f4bb412848e5fe379a.png https://uploads.disquscdn.com/images/d440cd03823e1b89b27883aa9710447c85aa338bfdeb78c6c36c755916928480.png Hello, I am trouble getting the VBE working for counting coloured cells, I have tried all the suggestions but still not getting it. The closest I got to was that it appeared “0” which did not calculate the coloured cell. That I guess is an improvement from #NAME?” or #VALUE?” messages. Please help!! Hi, please assist. if the cell is in cf it doesn’t count. i am using also the standard cf for date occuring. Hey Mart.. Yes this doesn’t work when conditional formatting is in play. IF you want to count based on CF rules, you can use the same rule you have used to apply conditional formatting and count the total values. For example, if you use CF to highlight cells that contain “Yes”, then use a COUNTIF function to count all these cells. How can you accomplish the same thing except counting cells in a row versus column (as outlined here)? For example, I want to know how many of each color (Red, Yellow, Green, and no color) are in row 2 (range – A2:I2). Side note/issue: The Subtotal function seems to only count cells that have something in them. I would like to count cells that are just a color without any text in the cell. Is that possible? I liked the VBA option, works like a charm. However if my data range is non-continuous , for example, instead of A1:A10, I need to count the cell color in A1, A4, A9, How should I modify the formula? Thanks. 50 = Green box color index. 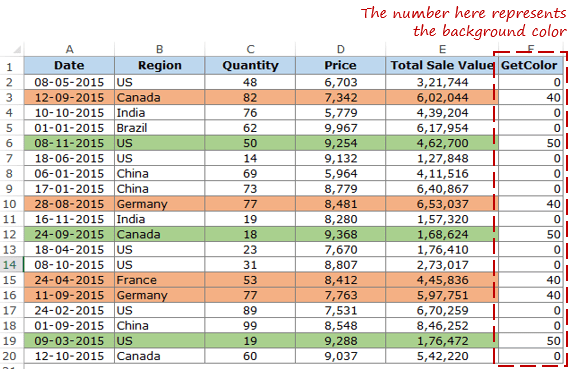 I started using your Count Cells Based on Background Color in Excel #3 using VBA. This wors very good. Thanks for it. But now I have a problem using the same function by checking cells where the background color is set by Conditional Formatting. I am checking for dates older than today() and mark these cells in red background; works well using conditional formatting but the count doesn’t work for these cells. 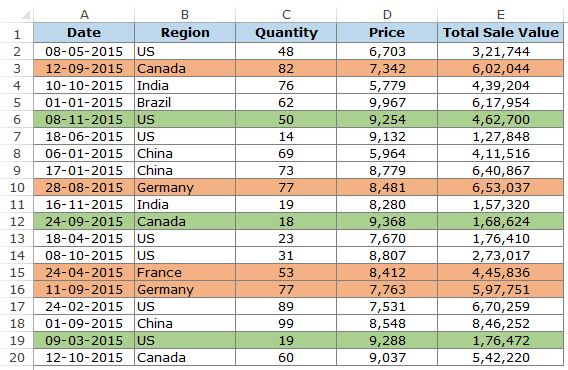 Do you use a formula in your conditional formatting (CF)? If you do, it returns TRUE and you are coloring the cells that meet that condition. 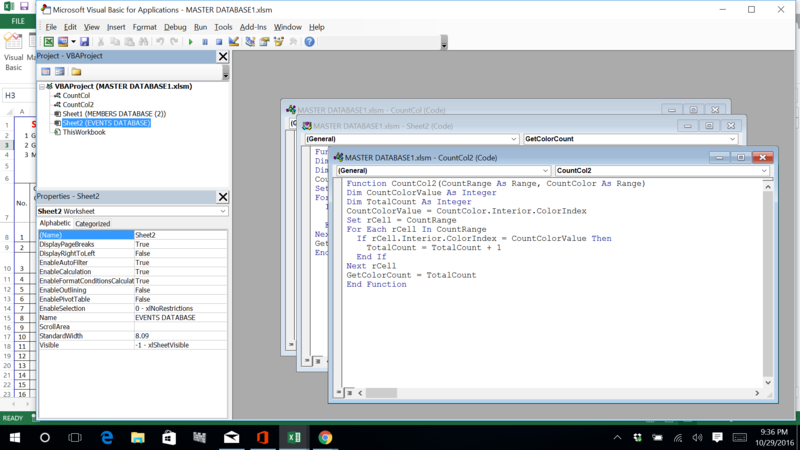 This means that if you put the CF formula into a COUNTIF formula, you can count the cells that meet the CF conditions! In A+ I only update the day =today(). I did a test and I realised I needed a help column to do the job. Say that range A2:A10 has your values where you apply the CF to. in B2 put ‘=OR(A2<$A$1,A2=$A$1)', copy down and you will get a couple of TRUEs or FALSEs. The count formula anywhere can then be: =COUNTIF(B2:B10,TRUE). Or you can just use an IF formula in the help column, giving you 1 or 0 back. Then a simple SUM somewhere and there you are. I must be do-able without the help column but I don't know how (yet)! A help column isn’t very usefull and would need many additional help columns, so I searched and searched. Thanks for the update and also for you providing the resources that led to the solution you found! An UDF (User Defined Function) is harmless in your case because you are using it in only one cell to get the count. So that’s great. In complex workbooks, where formulas must be in several rows, UDF’s are not recommanded unless no other choice because they make the workbook slow. I found a non-vba solution: an array formula. Put the following formula adjusted to your needs where you want your count. for each cell in range A2:A10, if the cell value is equal or less than the value of A1, give 1, otherwise give 0. Then give a sum of all the individual results. I’ve used 1 IF with an OR but it didn’t work so it became 2 IF’s. so i tried solution number 3 and it works! there must be a ‘trick’ to do this on my imac! Hello Raymond, I am having the same issue but am not exactly sure how to follow the workaround you posted. Should I paste ‘Application.Volatile True’ after the following row? Where should I put the code you have entered? I’m afraid I don’t know what the “worksheet event area” is or where I can find it. Thank you for your patience and a great guide! While in Excel, press ‘ALT+F11’ and that will bring you in the development environment. Your code for the workaround however disables copying and pasting? Do you know how to fix this?